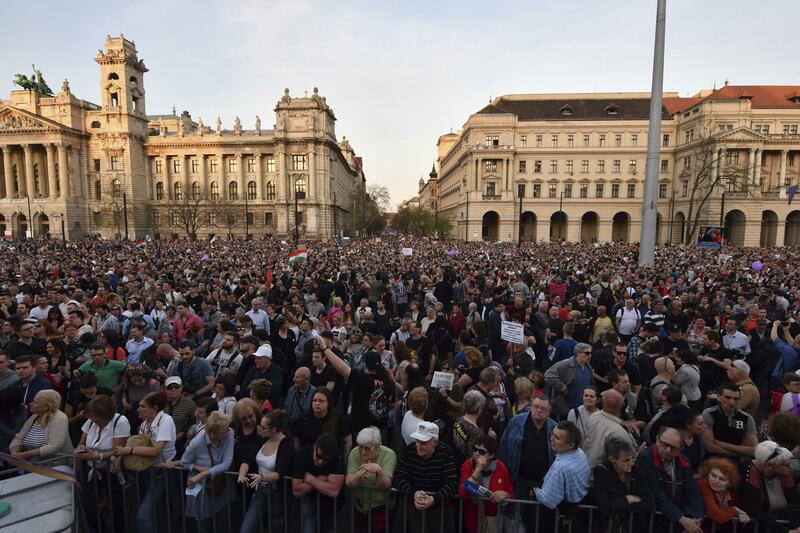 Sat., April 14, 2018, 12:58 p.m.
BUDAPEST, Hungary – Tens of thousands of anti-government protesters marched Saturday in the Hungarian capital of Budapest, demanding a new election and a new national electoral system in the biggest opposition rally in years. Prime Minister Viktor Orban was re-elected for a fourth term last week. His right-wing populist Fidesz party won a supermajority in the national assembly, with preliminary results showing that Fidesz and tiny ally the Christian Democratic party won 134 seats in the 199-seat legislature. Opposition supporters are upset that Hungary’s electoral rules have given Orban’s party such a large majority in Parliament when it only won around 50 percent of the vote. While the left-wing opposition parties won 12 of 18 seats at stake in Budapest districts, Fidesz won 85 of 88 seats outside the capital. The other 93 seats were allocated based on votes for party lists. The size of the crowd, overflowing from the city’s Kossuth Square outside the striking neo-Gothic Parliament, rivalled the pro-government “Peace March” held on March 15. Organizers said another anti-government protest would be held next weekend. Orban, whose campaign focused on the demonization of migrants, has promised “significant changes” in his next government, which could push for a constitutional amendment against migration. A fragmented opposition, a complex electoral system that disproportionately favors the biggest party and Orban’s decision to greatly facilitate citizenship for Hungarians living in neighboring countries like Romania and Serbia all contributed to his large win on April 8. Over 96 percent of voters in those bordering countries – including areas that Hungary lost after World War I – backed Orban’s Fidesz party. Homonnay said protesters had three requests: Changing the electoral system “which forever cements Fidesz in power;” ousting Chief Prosecutor Peter Polt, an Orban ally, because “as long as he is in office not a single corruption case will be investigated;” and getting Fidesz out of state media, which has become an unabashed promoter of government propaganda in recent years. Orban claims that opposition parties want to turn Hungary into an “immigrant nation” with the help of the European Union, the United Nations and Hungarian-American billionaire and philanthropist George Soros. Opposition members deny the claim. Published: April 14, 2018, 12:58 p.m.